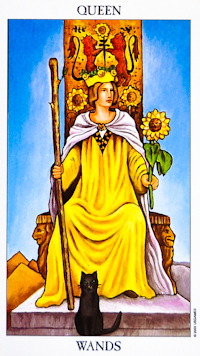 The Queen of Wands sits upon her throne that is decorated with lions facing opposing direction, a symbol of fire and strength. In her left hand and behind her are sunflowers, symbolizing life, fertility, joy and satisfaction. In her right hand is a wand which is beginning to blossom with life. With all these positive aspects, the Queen of Wands represents fidelity, warmth, and sustenance. However, at her feet is a black cat, related to her independent nature and her interest in occult and mysterious. The Queen of Wands is a go and getter, very optimistic, bold and never afraid to demonstrate how powerful she is to others nor does she shy away from a challenge. She is therefore a strong leader who focused on her desires, intending to get what she wants. Willful and Dynamic, very carrier oriented with greater competition needs. The Queen of Wands is a natural extrovert and enjoys being the center of attention. She is strong, independent and very creative, even in the face of adversity and you are masterful at engaging with others to achieve your goals, talented at staying fiercely determined and focused on her own goals while being friendly and optimistic with those around you. Passionate lover – Attractive and Magnetic – Generous and confident housewife. Dreams of being a celebrity. Fiery and passionate, with a quick temper. She may know to get all worked up, yell and scream. And, then give you a hug, all within the space of an hour. The true “drama queen”.